Everyone has heard about Mastercard and all the other types of credit cards. However there is another one out there. Eddy has come up with his own credit card. He hopes to gain a profit by selling them quite cheap and collecting off the charges his customers make. 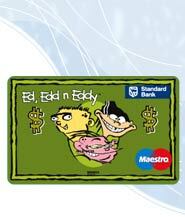 So far Eddy has sold over a thousand credit cards throughout the country. In three days he gained over 400 customers! We just had to talk to mr. moneyman ourselves to believe this. JBC: So Eddy how are you making a huge profit out of these cards? 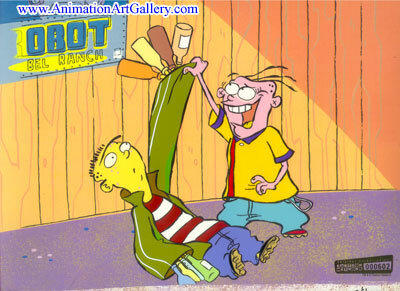 Eddy: Whats it to ya?! JBC: We just want to know. 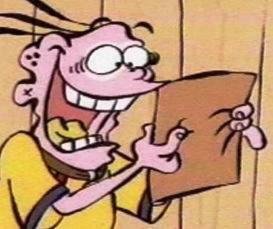 Eddy: Alright, I promised a total credit of 50,000 dollars on the card. JBC: Eddy you can't do that! Eddy: Sure I can. Who asked you anyway!? After the IRS heard about Eddy's new card they were quick to shut it down. Eddy will receive no profits for the cards he has sold and all refunds will be payed back. Eddy really wasn't to dissatisfied with the claims. He is used to failure anyways and will just try again tommorow. If you have this card please inform a local credit agency to get your full refund. Eds open up new recycling center. Rolf starts up new clothing trend. Edd makes new animal cleaning products. Made for the Eds by the Ed fans. We have all seen the various magazines that Eddy has stashed in his room. From pin-ups to chicks he has everything a young maturing boy would ever want. Recently Eddy decided to sell his magazines for more than street value. Kevin was one of Eddy's main customers, (suprisingly enough.) On record Kevin has bought over 10 magazines so far a total of $25.00. The local police of Peach Creek caught Eddy selling his magazines from a booth in the lane. They quickly stopped it. The police going easy on Eddy just confiscated his magazines and told him to not do it again. Here is a quote from Eddy after his magazines were confiscated by the police. Eddy: "They're taking them for their own viewing pleasure." Who can blame them though I would. Kevin hasn't mentioned pounding Eddy because he states that Eddy isn't such a dork after all. This surely won't last once Kevin finds out that the Eds destroyed his bike. Has Eddy learned his lesson? I think we can all answer that one. NO!! We wanted to give Rolf sometime in our newspaper because he to is important to Peach Creek. So without further to do here is Rolf's Advice Column. This question comes from Eric. Eric: Rolf my car isn't working right now and no one can fix it. What should I do? Rolf: Don't be such a nickumpoop. Just take the rubber stocking and firmly place it on hoobla boobler and shine twice with Nana'a secret pudding solution. Until next time I am Rolf son of a shepard. Eddys last scheme was never shown nor talked about in the Culde-Sac, but according to the records found on Edd's file, it is his most successful one yet. Eddy wouldnt tell us anything about the scheme except when and where it was going to be. Edds thoughts on this matter are as follow: I dont know why Eddy doesnt wand to reveal his plan. You didnt hear it from me, but, his plan is big, really big, even bigger than when I made the Statue of Liberty in the cul-de-sac when Eddy wanted to destroy Eds violin. 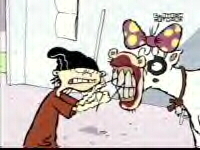 If it hadnt been for my clever thinking Eddy would have destroyed it. Oh dear, I just realized that Im the one who destroyed it. Oh Im so ashamed. Well any way, Eddy just keeps thinking UP. We left Edd to find a hopefully more reliable source. When we found him, we found out that we were wrong. Ed was just hopeless. When we asked him what the scam was all he said was: Butter toast. We then realized we made a mistake. We then tried to ask Eddy one last time what the scam was. All we got out of that was: Get lost. If you want to find out, pay to get into the unveiling. So we waited, and waited, and waited, until the day came. When we arrived at the cul-de-sac, the man that Eddy hired to guard the entrance to the lane asked for our names. We paid for all of the JBC crew. We counted down to the unveiling starting at 5. The unveiling happened and to much of our surprise, it was a giant piece of buttered toast. Everyone had to pay to get in because it was for a sample of the toast. Editor's note: We have learned not to doubt Ed for he is dumb, but knows his stuff every now and then. We do not like to do stories on schemes. Last Saturday Eddy's parents went out of town for the weekend. Eddy decided that he would try to gain back some popular points from the other kids of the Culde-Sac. 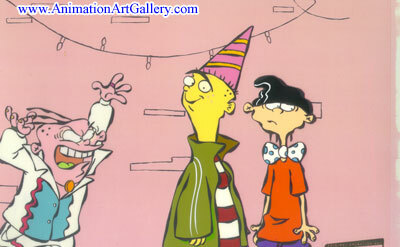 That night Eddy threw a huge bash for the whole block and everybody showed up despite Eddy being the host of the party. JBC was invited to the party to get the scoop on the greatest party in Peach Creek. The night started out pretty normal as all the kids arrived and began dancing and hitting the snack table. JBC reporters took the chance to interview some of the kids that we rarely get a chance to interview. JBC: Sarah how are you liking the party so far? Sarah: Move out of the way! Your blocking the snack table! Quickly sensing that Sarah was angry and when angry she has no rational thought we left the snack table quickly. The next person we decided to interview was Jimmy who was across the room from Sarah. JBC: Jimmy how is the party going? JBC: So what are your plans for tonight? We didn't get anymore quotes from Jimmy because Sarah saw us bothering him and threw one of the staff clear across Eddy's room. After that incident we stayed away from Sarah and Jimmy for the rest of the party. JBC: Double-D what do you think of the party? Edd: I'm quite enjoying myself. JBC: Do you think it was a good idea to do this? Edd: Not really but I couldn't convince Eddy not to have it. Nazz's baby-sitting Service has been in a slump lately for awhile because of the lack of kids living in the neighborhood. The last job she had was babysitting Eddy. After being interviewed it was very clear on how she felt. JBC: Nazz what are your feelings about the slump? Nazz: This is not cool. How am I supposed to buy makeup without money? That answered a lot of questions. Nazz hopes for new neighbors to move in so her business can flourish again. The JBC has full faith that her business will thrive once again. 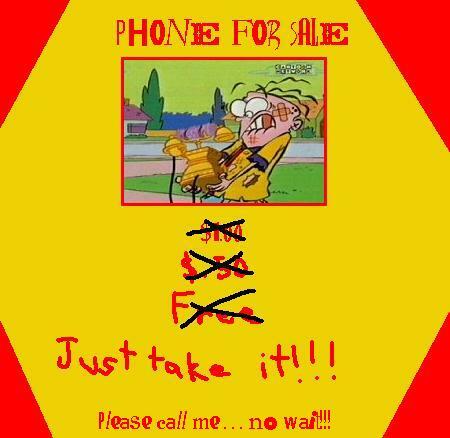 New phone for sale uh... free phone available please contact Eddy to claim it. HURRY!